Many readers send me an email with questions. Sometimes they send me a new toothpaste they want me to review. And what can I say for The Dirt Toothpaste or should I call it tooth brushing powder. But I need to thank a dear reader for sending me other great teeth cleaning options. I’m really thankful for receiving the link for The Dirt Tooth Brushing Powder. The Dirt toothbrush powder is powder in which you drop your wet toothbrush and use the dirt that is glued to the toothbrush as teeth cleaning substance. There is no foaming when cleaning your teeth’s with The Dirt, but trust me this powder will clean your teeth’s. Not only will it clean them but as well remineralize them. The reason for that is because all that powder is full of all kind of minerals. It is very easy to use these teeth cleaning powder. You can buy 51-gram glass jar that will last for a half year. It contains no fluoride, no xylitol and no any other chemicals that we find in various conventional toothpaste and some natural kinds of toothpaste. But what makes these teeth cleaning technique particular are ingredients. It contains only powder, Extra Fine Bentonite Clay, Baking Soda, Organic Saigon Cinnamon, Organic Cardamon Essential Oil, Organic Nutmeg, Organic Myrrh Gum Powder and Sweet Orange Essential Oil. As you see The Dirt Powder contains many essential oils, and we love essential oils, they are very beneficial to your health. In this case to the health of your teeth. The abrasive scale of this powder is 1-2, and that is very soft. Silica that is used in many conventional and many natural kinds of toothpaste have an abrasive scale of 7. Your enamel is at level 5. It is interesting how The Dirt company understands the modern problems with chemicals in toothpaste. They know that Xylitol is extracted from corn syrup and if you don’t know, but corn is often planted with GMO seeds. And we know that GMO food and ingredients are better to be avoided. 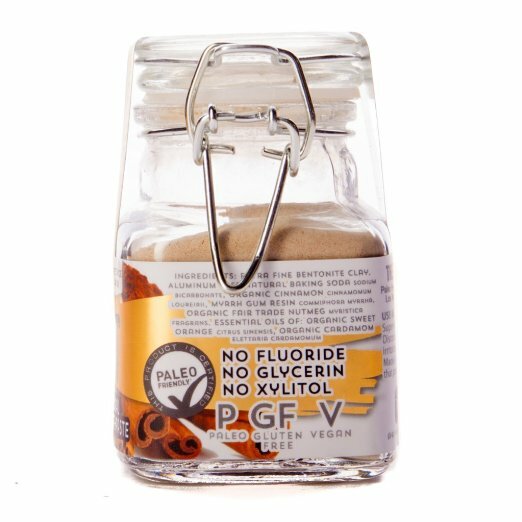 The Dirt Trace Mineral Powder is Vegan-friendly, Paleo friendly and as well gluten-free. It comes in a cute jar made from glass. One jar can supply you for a half year. But if you combine coconut oil toothpaste with The Dirt Toothbrushing Powder you can have amazing teeth cleaning method. Coconut oil for fighting bacteria and The Dirt Powder for whitening your teeth and remineralizing. What can I say? This toothpaste is amazing, 100% natural product that will make sure your teeth are clean and white. Maybe when you use this powder, you will have a feeling of dirt in your mouth, but when you wash it off with the water, you will have an amazingly clean feeling. Not only you will have naturally remineralized teeth’s, but also your teeth will whiten. As you see, I didn’t find any problem with this toothbrushing powder and because of that, this powder gets the highest possible rating. what drug can be clean dirt in the teeth?